The Future of Belt Alignment Technology is finally here! The B.A.T. Belt Alignment Tool System® is the latest innovation in laser belt alignment systems, utilizing our GlowLine™ green laser technology, and it is available in multiple configurations for every application. With our incredible TruView B.A.T. Belt Alignment Tool® Systems and Targets, the offset and angularity of the entire sheave face can be easily seen, and precision adjustments made. 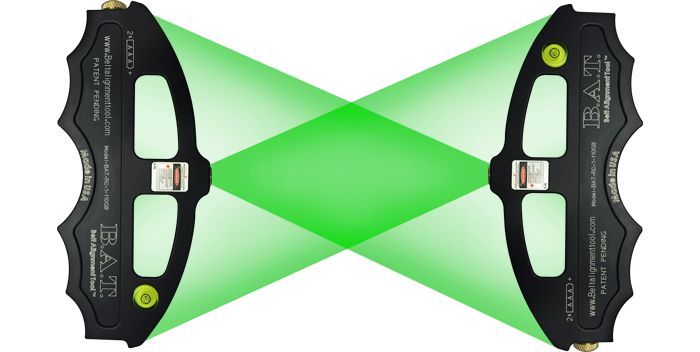 Only our Laser Belt Alignment Tool offers cross-firing XF green laser configuration, enabling users to check the offset, twist and angularity between both sheaves at the same time! The B.A.T. is fast, intuitive, accurate and easy to use! Unplanned failures and reliability problems with belt driven machinery can still exist even though you are using best practices such as laser alignment, vibration analysis, precision balancing, etc. The root cause of these problems can be misalignment that is misdiagnosed.